It is time you gave your carpet a new lease of life with a thorough steam clean. 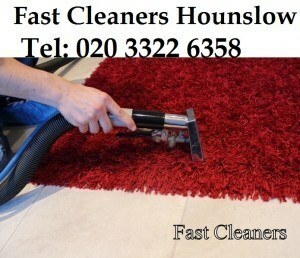 Fast Cleaners Hounslow provide professional carpet cleaning services in London and all Greater London areas. Far from just an ordinary scrub, we use sophisticated equipment that effectively cleans carpets and rugs down to the very roots. Using our carpet cleaning technique and a hot water extraction system, we are able to clean way below the surface of the carpet, reaching deep into the fibres and weeding out bacteria and stubborn stains. Your carpet will come out looking refreshed and smelling great. Other than advanced equipment we use non-toxic chemicals on your carpet for your safety and the good of the environment. Our staff are highly experienced in rug cleaning and are able to offer recommendations on how to best clean and maintain different kinds of carpet. Where steam carpet will be ineffectual we will recommend you to try our dry carpet cleaning service Hounslow. The beauty with this method of cleaning is that no time is needed for drying out the carpet. It is also an ideal cleaning method as it eliminates all agents of allergies. The fact that the original colour of the carpet is well preserved will thrill many homeowners. To further reduce chances of colour, running a careful examination of carpet is carried out before work begins. Our cleaners always go the extra mile to guarantee your satisfaction and will clean the areas under the furniture where the carpet is for free. To find out more about our carpet cleaning prices get in touch with our cleaning company on 020 3322 6358.